Ogilvy and Mather, Mexico had a challenge. They had to come up with an innovative campaign with high PR value for a cancer benefit organisation, Case de la Amistad. What’s the one thing that Cancer kids long for, the most? It’s not health or the length of life. No, kids don’t think that way. Their wishes are very basic. They simply want lustrous hair to help them feel normal again. Keeping this in mind, they came up with the world’s first metal concert where the ticket was… hold your breath… hair. Where else would you find that much hair all at once, right? 9 bands put together a thrilling metal concert where people could only enter if they chopped their hair off and submitted it. The hair was then made into wigs for these children. Sprint bagged in Pharrell Williams to headline the Sprint Sound Session, a music event at New York City’s Webster Hall to launch the mobile service provider’s new HTC M8 phone. 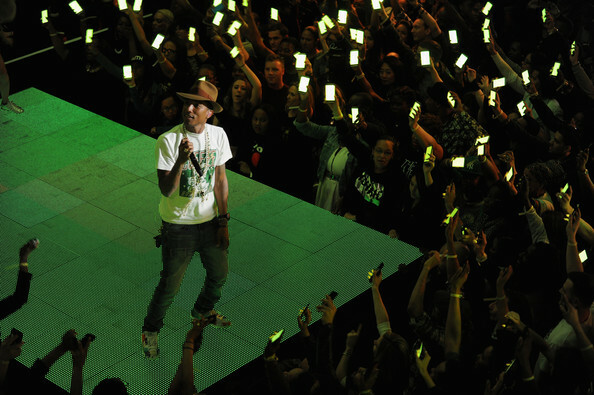 Each member of the audience was given an HTC phone, and together the phones were the sole source of audio for Pharrell, as he performed his popular hit “Happy”. The phones, powered by Sprint’s wireless network, were also synched to flash and change colors to the beat of the tune synched to flash and change colors to the beat of the song. This idea takes concerts to the next level. I wouldn’t say that they created unbeatable experiences but such things work great at gimmicky marketing. The creativity and innovation in the idea is extraordinary. It puts the phone, which was being launched, at a position of power and displays it’s strength in an exaggerated, yet relevant and original manner. This is a reminder of how technology constantly keeps evolving and that there are no limits to its’ application. Pharrell’s performance is expected to be the first of several “Sound Sessions” by Sprint. Here’s a look at the performance. Do write your thoughts down in comments.